Posted in Announcements, Community Based Initiatives, Culture, Economic Development, Music and Performance, Special Events. 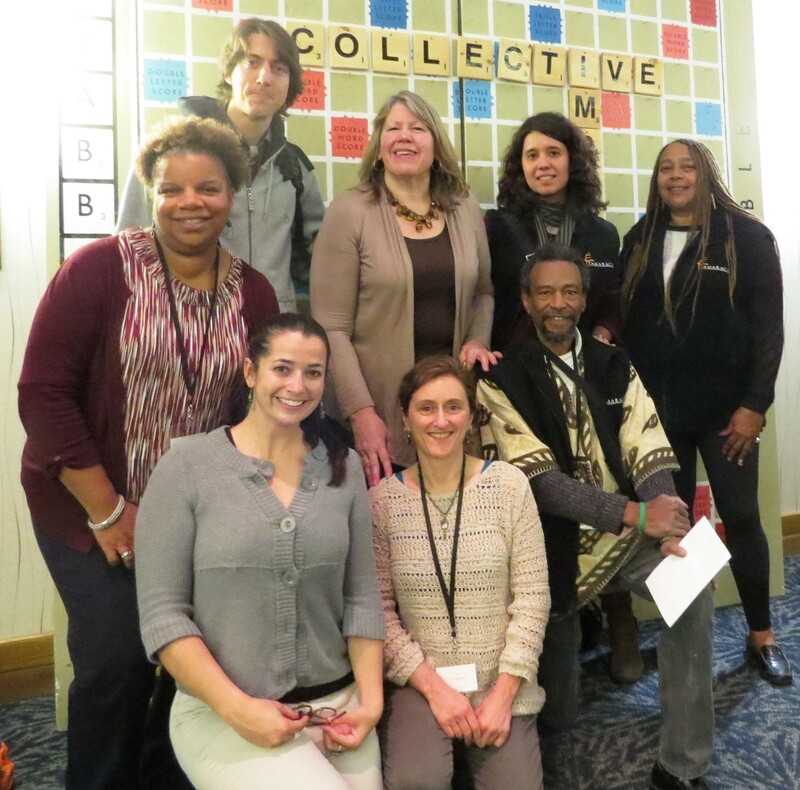 Eight representatives from Tompkins County spent 5 inspiring days in October at the recent Tamarack Institute Collective Impact Summit in Toronto, Canada. Among the 300 participants were people from Canada and the Northwest Territories, USA, Kenya, New Zealand, Australia, and Denmark. The purpose of the summit was to help participants learn how to use Collective Impact to solve complex problems in their communities. They emphasized that Collective Impact requires a new mindset and way of operating, and widening our focus beyond the success of individual programs to the effectiveness of the systems that impact us all. No, we don’t have to quit our jobs or shut down our organizations. But the process of weaving all of our efforts together will require a shift in our thinking. One big lesson emerged from the success or failure of Collective Impact initiatives in other places: it is crucial to include a really significant percentage of people who are most directly affected in the work of planning and decision making. Posted in Collective Impact, Community Based Initiatives, Economic Development, Eliminating Poverty, Networks. 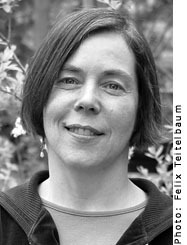 Jan Norman of Silk Oak and Ithacamade, whose businesses exemplify a commitment to socially-minded business practices, including being certified Living Wage Employers. Jan engages with the community in ways that promote sustainability and education, and she has worked tirelessly to make Ithaca a vibrant, living local economy. Congratulations, Jan! 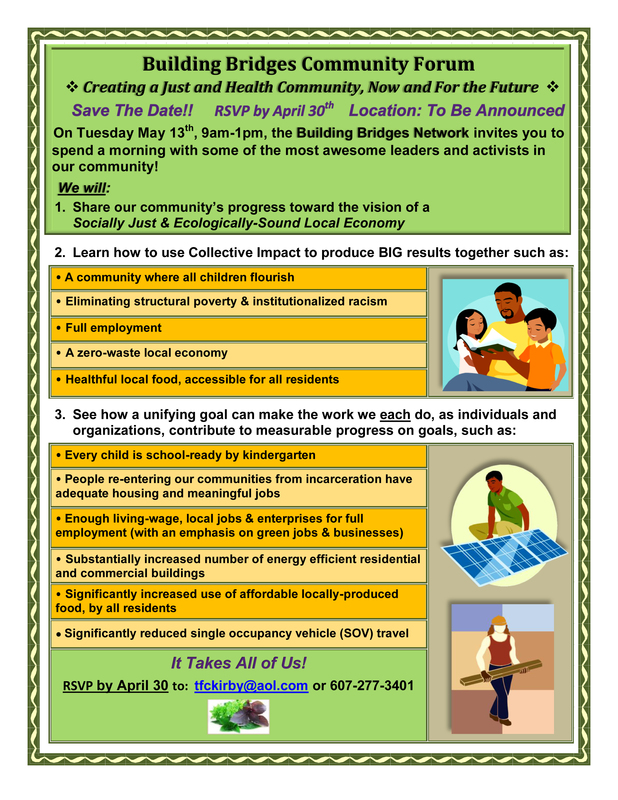 You are a role model for the Building Bridges Network and you live the vision of a socially just, ecologically sound local economy. Posted in Announcements, Economic Development, Leadership, Social Justice, Socially Responsible Business. Much has happened in the community since the first Building Bridges gathering back in November, 2011, but we still have a ways to go. The lists of activities and possible big results in the attached flyer are only examples of the things we can explore together as we move forward and are not meant to be exhaustive. Please respond by April 30th to let us know whether or not you can come to the forum (email- tfckirby@aol.com, phone: 277-3401). You are receiving this invitation because you are an important community leader. Please note: If you forward this message to someone else you’d like to invite, please emphasize that we do need to get RSVPs so we can plan for food and materials. On behalf of the Building Bridges Planning Group, we hope you can come. Posted in Announcements, Community Based Initiatives, Economic Development, Education, Eliminating Poverty, Food Systems, Jobs, Race and Racism, Social Justice, Sustainability and Resiliency, Youth. Through our scientific and technological genius, we have made of this world a neighborhood and yet we have not had the ethical commitment to make of it a brotherhood. But somehow, and in some way, we have got to do this…We are tied together in the single garment of destiny, caught in an inescapable network of mutuality …whatever affects one directly, affects all indirectly. Delivered by Martin Luther King Jr. over 45 years ago as an impassioned call for “Remaining Awake through a Great Revolution”, these words seem more relevant than ever to the linked economic, environmental and social calamities we face today. Our global economy and its effects on nearly every facet of our lives is increasingly seen as a root of these problems. With a warming climate and epic failures like the BP oil disaster and financial crisis, this system and its structures are looking catastrophically flawed and outdated. The “economic genius” of Frankensteinian creations like derivatives has turned our world economy into a shell game, with perhaps the worse yet to come. Communities have become ground zero for a resource extraction model seeking to maximize short-term profits for distant stock holders while externalizing as many costs as possible. Those “externalities” include many of our own who are left behind as the divide between the haves and multiplying have-nots grows. Making matters worse, the reach and influence of the too-big-to-fail juggernauts responsible for these crises extends deep into our systems of governance, playing no small part in the recent government shut-down. At the same time, a growing number of communities like our own are grappling with how to sustain basic civic infrastructure, including water, transportation, health, social services and educational systems. Put into place decades or centuries ago, many are now crumbling and we find ourselves without adequate means to maintain or replace them. Extreme events like Hurricanes Irene and Sandy, expected to increase in frequency, are also revealing a lack of resilience in our support systems and compromised landscapes. We seem to be caught in a destructive feedback loop, unable to break free from a system that is continually reinforcing itself (with the help of bailouts and subsidies) while weakening our communities and endangering the planet. Some are wondering what alternatives might exist – how can we reinvent a new economy that serves, not consumes us?